Just wanted to tell you our table, stools, and Lego mats arrived and the quality is awesome! 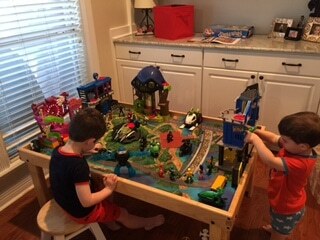 Our boys love the table and have wanted to play with ALL sorts of toys on it. We have the rolling storage bin set to arrive this week and I can’t wait. Thank you for making such a great quality product (that has multiple uses) at such a fair price-I’ll definitely recommend your products to my friends!